Offering you a complete choice of products which include hepcinat 400mg, hepcinat lp, sofosbuvir 400mg tablets and ledipasvir sofosbuvir medicine. 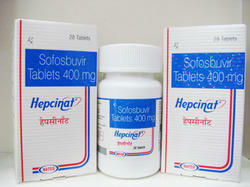 Hepcinat Contains Sofosbuvir 400mg which cures long-term hepatitis C virus (HCV) issues in specific people. It should be utilized alone or together with ribavirin. Sofosbuvir is actually some kind of HCV nucleotide analog polymerase substance. It minimizes the level of HCV in the human body through avoiding the spread of the HCV inside the human body. Sofosbuvir is one of the new direct-acting antiviral drugs that target different steps of the hepatitis C virus (HCV) lifecycle. It is a nucleotide analogue HCV polymerase inhibitor, meaning it blocks the polymerase enzyme which the virus must use to reproduce. Sofosbuvir should be combined with other medications, which may include pegylated interferon (which stimulates the body's own immune response), ribavirin or other direct-acting antivirals that work differently. Sofosbuvir can easily intermingle with rifamycins, hydantoins and tipranavir so consult the doctor before intake of the medication to avoid complications.Women planning to get pregnant or pregnant ladies should avoid the usage of Sofosbuvir as it may lead to abortion or it may affect the fetus. Breast feeding should also be avoided as it may pass through to new born babies. In most cases, you will take one tablet of Hepcinat each day for a period of 12 weeks. Sofosbuvir raises side effects such as nausea, lack of sleep, skin itching or rash, fever,skin color changes, headache, cough and mouth sores. Company Name: NATCO PHARMA LTD.
Hepcinat-LP (Ledipasvir and Sofosbuvir) are the breakthrough treatments for Hepatitis C infections. Its mechanism of action involves inhibiting the enzyme which is necessary for the virus if it is to multiply. A complete cure may even be possible. Chronic hepatitis C is a serious infection of the liver which occurs following an infection with the hepatitis C virus. Upon reaching the cells of the liver, the virus begins to multiply, which it achieves by means of copying its DNA and RNA. This medicine is known as a nucleotide polymerase inhibitor, and it works directly on the virus itself. 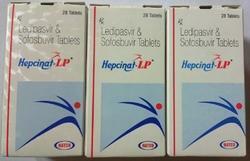 Hepcinat-LP (Ledipasvir and Sofosbuvir) each tablet contain Ledipasvir 90mg + Sofosbuvir 400mg. The dosage schedule must be individualized by the physician in charge of treatment and will vary according to the viral genotype that is being treated. Adult patients will usually be directed by their physician to take 1 tablet per day and it can be administered alongside a meal or else without food. Patients who are undergoing treatment for Hepatitis C with Hepcinat-LP (Ledipasvir and Sofosbuvir) will require regular visits to their physician or the hospital so that routine blood tests can be carried out. The frequency at which these tests are required will be determined by your physician. There is a risk of birth defects or other serious harm to an unborn baby associated with this medicine and it should never be taken by pregnant women. A minimum of 2 effective non-hormonal barrier methods of contraception should be used at all times during treatment and for at least 6 months following the completion of treatment. It is very important that patients are aware of the fact that there is a risk of infecting others with hepatitis C and taking this medicine will not prevent this. Male patients should also not take this medicine if their partner is pregnant, as harm could be caused to an unborn baby if a child is fathered by a man who is taking this medicine. Sofosbuvir 400mg cures long-term hepatitis C virus (HCV) issues in specific people. It should be utilized alone or together with ribavirin. Sofosbuvir is actually some kind of HCV nucleotide analog polymerase substance. It minimizes the level of HCV in the human body through avoiding the spread of the HCV inside the human body. Sofosbuvir is indicated for use by adults with chronic hepatitis C, meaning infection lasting more than six months. It is approved for people with HCV genotype 1, 2, 3, 4, 5 or 6. Genotype 1 is the most common type in Europe and considered the hardest to treat. Sofosbuvir can be used by people being treated for hepatitis C for the first time (known as 'treatment-naive') and for retreatment of people who were not cured with previous interferon-based therapy (known as 'treatment-experienced'). Ledipasvir and Sofosbuvir are the breakthrough treatments for Hepatitis C infections. Its mechanism of action involves inhibiting the enzyme which is necessary for the virus if it is to multiply. A complete cure may even be possible. Chronic hepatitis C is a serious infection of the liver which occurs following an infection with the hepatitis C virus. Upon reaching the cells of the liver, the virus begins to multiply, which it achieves by means of copying its DNA and RNA. This medicine is known as a nucleotide polymerase inhibitor, and it works directly on the virus itself. Ledipasvir and Sofosbuvir each tablet contain Ledipasvir 90mg + Sofosbuvir 400mg. The dosage schedule must be individualized by the physician in charge of treatment and will vary according to the viral genotype that is being treated. Adult patients will usually be directed by their physician to take 1 tablet per day and it can be administered alongside a meal or else without food. Patients who are undergoing treatment for Hepatitis C with Ledipasvir and Sofosbuvir will require regular visits to their physician or the hospital so that routine blood tests can be carried out. The frequency at which these tests are required will be determined by your physician. Looking for Hepcinat Tablets ?